AUTHOR INFORMATION: Félix J. Palma has been unanimously acclaimed by critics as one of the most brilliant and original storytellers of our time. His devotion to the short story genre has earned him more than a hundred awards. The Map of Time is his first novel to be published in English. It received the 2008 Ateneo de Sevila XL Prize and will be published in more than 30 countries. PLOT SUMMARY: Privileged Andrew Harrington is a despondent young man who plans on killing himself. Eight years earlier, he had found the love of his life. It didn’t matter that their lives were vastly different—he born to a rich and entrepreneurial family and she a woman struggling to survive as a prostitute in London’s seedy Whitechapel section. He’s determined to declare his love for her and live happily ever after, even if it means leaving his privileged life behind. Everything changes however, when his beloved Marie Kelly becomes the last victim of the villainous Jack the Ripper. Claire Haggerty is young, wealthy, and very dissatisfied with her life. She’s sure she’s been born into the wrong time in history. She has no interest in the men who court her and she certainly has no interest in marrying any of them. She fears she will never find a man who will utterly sweep her off her feet and make her fall helplessly in love. That is, until her cousin Lucy talks her into buying a ticket to one of the expeditions to the year 2000 through Murray’s Time Travel. All the advertisements boast of an incredible battle over the fate of the world between humans, led by the heroic Captain Derek Shackleton, and automatons. Entranced by Captain Shackleton’s courage—not to mention his manly physique—Claire is positive that she’s finally found the man she’s been looking for. She’s determined to go on the expedition and steal away from the group, profess her love for Shackleton, and stay with him in the future. In the third act of The Map of Time, H.G. Wells must ‘save’ his own life. A brilliant writer who doubts his own skill, Wells has just finished the manuscript for The Invisible Man. No one, not even his beloved wife Jane, has read it. So naturally he’s horrified when he learns that the opening lines to The Invisible Man have been scrawled on the wall above the body of a homeless man who has apparently been murdered by a weapon not of this world. His horror mounts when two additional murders take place, each accompanied by mysterious opening lines, followed by a map requesting his presence at 50 Berkeley Square—the most haunted house in London. CLASSIFICATION: Historical fiction, alternate history, time travel, mystery, steampunk, pulp adventure, romance and Victorian London collide in The Map of Time, recalling elements of H.G. Wells’ The Time Machine, Jules Verne, The Prestige by Christopher Priest, Gordon Dahlquist's The Glass Books of the Dream Eaters, From Hell, and The Time Traveler’s Wife by Audrey Niffenegger. FORMAT/INFO: The Map of Time is 624 pages long, divided over three Parts and forty-three Roman-numbered chapters. Narration is in the third-person omniscient via an unknown narrator who will occasionally break the fourth wall and address the audience directly. The Map of Time is self-contained, but I believe the book is part of a trilogy. 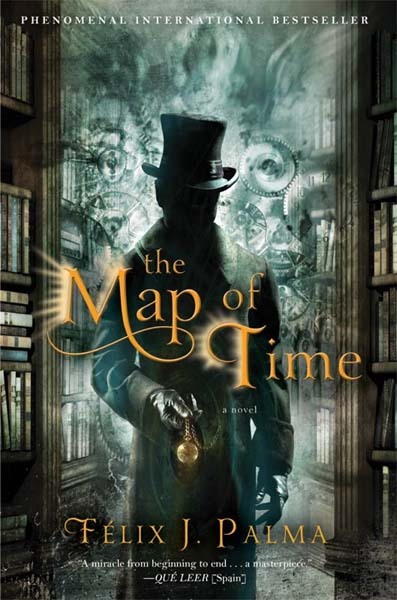 June 28, 2011 marks the North American Hardcover publication of The Map of Time via Atria Books. The UK version (see below) was published on June 9, 2011 via HarperCollins. The Map of Time was translated from Spanish to English by Nick Caistor. ANALYSIS: Welcome, dear reader, as you plunge into the thrilling pages of our melodrama where you will find adventures of which you never dreamt! If like any reasonable person you believe that time is a river sweeping away all that is born towards the darkest shore, in these pages you will discover that the past can be revisited, that mankind can retrace his footsteps thanks to a machine that can travel through time. Your emotion and astonishment are guaranteed. So begins Félix J. Palma’s astonishing novel, The Map of Time. 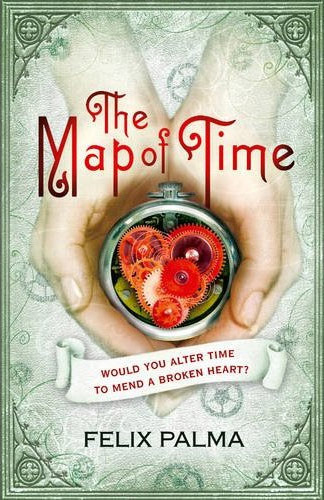 A novel about time travel—set during Victorian London—that was inspired by The Time Machine and pays homage to its famous author, H.G. Wells, who is not only a character in the book, but the main protagonist. As a fan of time travel—who doesn’t like Back to the Future or Terminator?—Victorian settings and H.G. Wells, The Map of Time immediately captured my interest and filled me with excitement. However, much to my delight, reading The Map of Time was even better than anticipated. Characters for instance, are incredibly lifelike with their innermost thoughts and feelings intimately portrayed. Fittingly, Félix J. Palma spends the most time with Herbert George Wells, fleshing out the events that fired his passion for literature and writing; his roundabout path to becoming a published author instead of a baker’s assistant; the meeting with Joseph Merrick—the Elephant Man—that inspired The Time Machine and The Island of Dr. Moreau; and his opinions on such varied topics as book reviews, the social commentary found within his novels, love, parallel universes, fate vs. free will, and so on. Since The Map of Time is a work of fiction, Félix J. Palma does take liberties with certain aspects of H.G. Wells’ life, but because the author writes with such authenticity and attention to detail, it’s impossible to separate fact from fiction. Andrew Harrington, Claire Haggerty, Captain Derek Shackleton and Inspector Colin Garrett of Scotland Yard are written with the same skill and intimacy, but none of these characters are as compelling as Wells, although Gilliam Murray—a supporting character—succeeds as an interesting rival to the author. Félix J. Palma also does a masterful job with the setting, recreating a Victorian London that makes the reader feel like he traveled back in time. Personally though, I was more impressed with the author’s ability to integrate actual historical figures and places into the novel in a manner that felt natural and convincing, including Jack the Ripper, Marie Kelly, Whitechapel, Joseph Merrick, Dr. Treves, Henry James, Bram Stoker, and 50 Berkeley Square. I also appreciated the numerous references to the era—Charles Dickens, Edgar Allan Poe, Darwin, Jules Verne, Robert Louis Stevenson, Nikola Tesla, Allan Kardec, Sir Arthur Conan Doyle’s Sherlock Holmes, King Solomon’s Mines, Inspector Frederick Abberline—that reminded me why the Victorian period is one of my favorite settings in literature. Time travel meanwhile, is represented in The Map of Time by four different methods: the very same time machine that is depicted in H.G. Wells’ classic novel; a fourth dimension—described as a pink plain—where time is stopped and its inhabitants can create holes to different moments of the time continuum, including May 20, 2000; a machine that digs tunnels through the fabric of time; and Homo temporis, humans who developed the ability to travel through time using their minds. Only one of these methods is actually viable in the book, but all four concepts provide the reader with countless pages of entertainment, thought-provoking moral complexity, and mind-bending paradoxes. Plot-wise, The Map of Time consists of three Parts, each Part relating a separate tale, with all three stories connected by certain characters and themes including H.G. Wells, Gilliam Murray, love, and time travel. The story’s strength lies in its unpredictability, which in turn, is orchestrated by a mysterious omniscient narrator who uses clever misdirection, well-timed surprises and shocking plot twists to constantly keep readers on their toes. At the same time, Félix J. Palma manages to keep things accessible, despite the complexity and ambitiousness of the story. Anyway, this sounds like a very interesting novel and I am looking forward to see if it is. Wow, great review, for something that sounds like a ton of fun! Rarely do I read a review and immediately start a search for the book. This is turning into one of those times! I love your review--no. Not the book. I mean your review. You are comprehensive, specifically positive and negative, all without giving anything away. Kudos. It even made me thing about reading the book. Which I might. Might not. I've gotten jaded about H.G. Wells popping up in varied forms. Sick of any books set in Victorian times, prettified or realistic, and profoundly sick of Jack the Ripper, but that is because of a traumatic workshop experience I cannot now relate (insert small gasp, hand to mouth. Then a long sigh). Who knows though? Maybe I've finally found something to heal my trauma. Doug, Little Red Reviewer, I'm glad I could be of assistance :D Hopefully you'll enjoy the book as much as I did! This book looks fantastic, thanks for the thorough review, definitely won me over. Definitely one of my favorites this year! I've just ordered this book (mainly due to your review). Really looking forward to reading it, but I've got to clear my TBR pile first. I want to read A Dance With Dragons first though.